The story follows Elin Richards, 13, who has always felt different. Struggling day-to-day with her distinctive appearance, all Elin wants is to be like everyone else. School is a nightmarish and lonely place, and Elin only feels truly at ease when she’s riding her beloved horse, Hebe. When Elin finally snaps and strikes a boy in her class, the consequences are far reaching. Then someone close makes a suggestion that will change Elin’s life forever. You can find out more about Elin and some of the other characters in the book here. 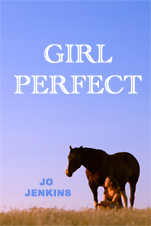 GIRL PERFECT is available for the Kindle in the UK, US, France, Germany, Italy and Spain. Other formats will be available in future. If you’re at all curious about the author, click here.